Jan McCanless has served up another delicious murder mystery, this time involving the unassuming, but, very capable Abbot Jerome from the Monastery of the Blue Ridge, located in Ridgeville, NC that just happens to be down the road a couple miles from the summer home of Steve and Suzanne Thomas. 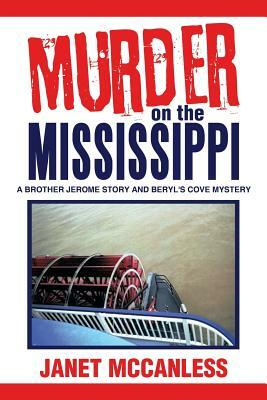 On a Mississippi cruise with his meddlesome sibling, a body is discovered hanging on the paddle wheel that sits off the stern of the boat. With just 72 hours before returning to port in New Orleans, the Abbot gets involved in solving the murder. With no one aware that he is a monk, he sets about to find the murderer, hindered by the women passengers who consider him fair game. Once back at the monastery, things do not go well, as Abbot and his new found friend, a federal agent, become embroiled in even more skullduggery, along with the group of monks and misfits that occupy the monastery. Come along for the cruise of a lifetime with our principals, and guest appearances along the way from that delightful Beryl's Cove bunch, and of course, Dawg and Elvis, and their new friend, Max, the Basset Hound.